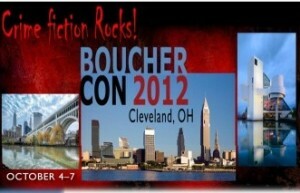 This entry was posted in Bouchercon, cleveland, Joe Hartlaub, John Gilstrap, Michelle Gagnon by Joe Moore. Bookmark the permalink. Only been to one Bouchercon, the one here in Anchorage AK in 2007, and it was a blast. I hope to go to one again soon. That and ITW are my two big conferences I’d love to attend. I was at the Bcon in AK in 2007, Basil. I met my ITW debut author buddies, visited with my long time AK friends, & took research photos for my book, EVIL WITHOUT A FACE. Good times. The conference was great. I’ll be there, showered, shaved and tap-dancin’! Looking forward to meeting you, Joe. Woot! Can’t make it this year, Jordan, but I’ve really enjoyed going in the past. Have a great time. Thanks, Joe. Wish you could make it. I hope to meet a few TKZers there (for the first time). Michelle, Boyd, & Joe H. That alone will be worth the trip. I will indeed be there. B-Con and T-Fest are the two I work very hard not to miss each year. My panel is at 11:30 on Friday morning, and it’s called Manfiction: Stories of tough guys who get the job done. Andrew Gulli of The Strand will be moderating, and other panelists include Max Allan Collins, Leonard Rosen, Andrew Grant and Andrew Kaplan. It should be a pretty good show. And you might could be able to find me in the bar in the evening. Can’t wait! This will be my fourth Bouchercon. Looking forward to seeing everyone there. My panel is on Saturday at 9am, and it’s called Give Me a Thrill: Edge of your seat action that makes you stay up way past your bedtime (wow, I didn’t realize until I typed the title that this could be a panel about 50 Shades of Grey). The moderator is Karen Dionne, and my fellow panelists are Linwood Barclay, Mike Cooper, James Tabor, and Owen Laukkanen. You panel sounds really good, John G. Hope to see you over a cool beverage in the bar too. An author’s natural habitat. Anne–I wish you could be there too. BCon is always fun. Lots of characters show up. Boyd–Your panel sounds good too. 50 shades, huh. I know your moderator, Karen Dionne. You’re in good hands. Have fun in Cleveland, the heart of rock n roll. Hi Jordan, wish I could go. This is the first I’m hearing about it but definitely something I’d love. I guess it’s at a different location each year? Hope you have an amazing time. Hey Alice–Great to see you here. Yes, they move Bouchercon around the country to some great locations each year. It’s a reader based conference, so you should definitely consider attending as an author. Your romantic suspense books would get some reader love. Organizers do their best to get every author on a panel, which is handled differently than RWA does their proposal way. You’d have a better shot at getting on a panel, which is always fun. Happy writing. Conferences are always inspiring. Hope you have lots of industry buzz to share when you come home. Take notes! I’m so excited to go, and to be on a panel with you, Jordan! I love Bcon, haven’t missed one in years. Hey there Nancy. I’m not much of a note taker, I’m afraid, but if I hear any good skuttlebutt, I’ll be sure to mention it. There’s no note taking in the bar. Ha, Moni! Great to see your here. You guys, Monette is the best panel moderator – EVER. I don’t know how she does everything she does, but I am really looking forward to meeting this dynamo. I feel so lucky she asked me on her panel. Truly. Hey Michelle. It will be weird that we are on a YA panel together at BCon too, but I am excited about that…and meeting you for the first time. It’s about time, huh? Cheers! And I’m so excited about your debut YA – DON’T TURN AROUND – being featured on Entertainment Weekly’s website. Very cool. Actually, I think I just read an email where Michelle Gagnon’s YA debut got featured in EW’s magazine too. Very proud of my girl. HA! I would buy out the west coast too. HUGE news. I wish I still subscribed to EW. I’d send you an extra. Damn…the one year I decide not to go! I really wanted to meet all you guys since I have only met Kathryn, John and Joe before. Well, bend an elbow for me and have a great time on your panels. I know. I’ve met you & your sis at my first Bcon, but if you insist we raise a glass in Cleveland, okay. Ill be there & plan on attending the romantic suspense panel. This will be my first conference. And I get to promote my debut novel launching in 2 weeks. I’m so excited! Hey Nancy. Be sure to say hello after. I’d love to hear more about your book. Congratulations!